The so-called cellulite "embedded" is manifested by an increase in the size and number of fat cells, with stiffening of collagen fibers and formation of adipose subcutaneous nodules, which can become hard and painful to the touch. The connective tissue loses elasticity and skin dimpling brand ( "orange peel") particularly hard to dislodge. This is why it is advisable to deal with cellulite creams formulated specifically. 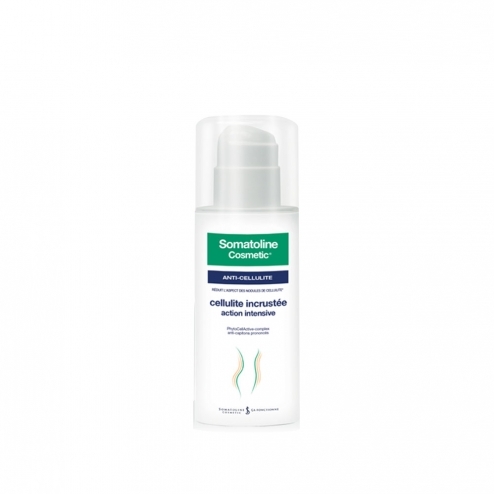 Somatoline Cosmetic Embedded Cellulite - Intensive Action, is specially formulated to combat the effects of the pronounced cellulite. - Women seeking an etchant, effective on stubborn cellulite in one application per day, as well as the proven anti-recurrence action. Apply 1 time per day with an appropriate dose of product on the areas to treat. Massage in light circular movements and continue to massage the legs by pushing upwards. You may feel a warm sensation and / or cold sometimes accompanied by a slight tingling or redness. The intensity of these reactions, which usually disappear within 30 minutes, depends on individual sensitivity. Wash hands thoroughly after use. Formula INCI: Aqua, Cyclopentasiloxane, Caffeine, Pentylene Glycol, Caprylic / Capric Triglyceride, Glycerin, Cetearyl Alcohol, Sodium Cetearyl Sulfate, C12-15 Alkylbenzoate, Sodium salicylate, Parfum (Fragrance), ESCIN, Hydroxycitrate Carnitine, Lecithin, Sodium Benzoate, Chenopodium quinoa Seed Extract, Butylene Glycol, Cetyl Alcohol, Ceteth-20, Steareth-20, Ethyl Nicotinate, glyceryl stearate, Menthol, PEG-75 stearate, Xanthan Gum, Menthol, CI 42051, Sodium Hydroxide.